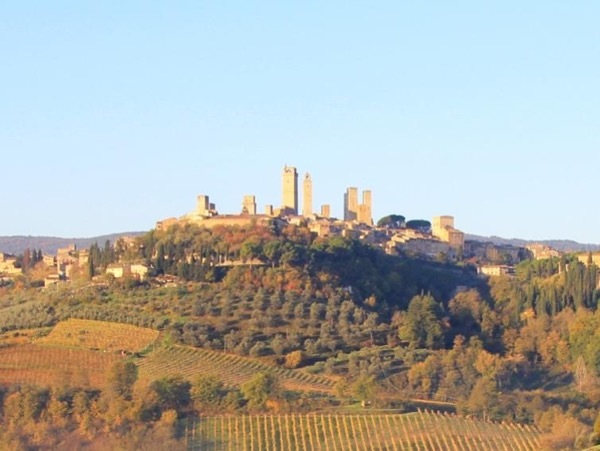 Traveler Reviews for Private Tour in San Gimignano, Italy by Tour Guide Elisabetta M.
Elisabetta is very knowledgeable, articulate, patient and just a pleasure to be with. She tailored her work to our specific interests. Our enjoyment of the incredibly beautiful area of Siena and the neighboring hill towns was greatly enhanced by our having hired her. TOUR GUIDE RESPONSE: Grazie Bill, thank you so much for your kind words. A pleasure to be with you all. Elisabetta gave us a 2 hr walking tour of San Gimignano. She is an excellent communicator- from my first email inquiries until the day of the tour. She is a font of knowledge and her pleasant, fun personality made for a great tour. I had some mobility issues due to an injury and she could not have been more patient and accommodating. I would highly recommend her for any of her tours. Thanks again for a great day! What an absolutely spectacular experience. Despite the fact that our driver became confused and had to call her for directions, and we were slightly late because of those circumstances, Elisabetta was absolutely kind and wonderful to our group of 19. She showed us all of the marvelous places throughout San Gimignano, detailed the wonderful history in such a way that we could actually picture it, and even went out of her way to ensure that we could respectfully witness St. Augustine's before our lunch. Elisabetta designed a wonderful tour for us hitting all of the points of interest we wanted to see, plus some tea amazing ones! We had a great day and learned so much about Italy from her! Thank you!! TOUR GUIDE RESPONSE: Grazie Heather, so good to have met you, it was a lovely day! We had not been in San Gimignano before and she was kind enough to guide us there - very convenient for our group. She was amazingly well versed in the city's sights and had truly a mastery of the art, churches and history of the city. We were so pleased, we happily hired her for a second tour in San Gimignano when other guests came to stay with us. We would highly recommend her as a delightful and professional guide.